This week I returned to my little village from Cyprus and apparently brought a bit of the sunshine with me which has meant lovely long evenings for the children playing out on the trampoline, bikes and scooters with their friends. And on Thursday after dropping off some of my children at choir practice I was wandering back home with Grumpy when a front door flew open and a friend who'd seen us walk past invited us in for a cuppa. Hurrah for village life! Grumpy was delighted to have the chance to play with his friend and I was glad of the chance to bask in the sun and gossip exchange news with my friend. As you can see we were in a lovely little garden, with a fantastic playhouse stuffed with toys and crafts and a bedroom equally filled with lovely things to play with. 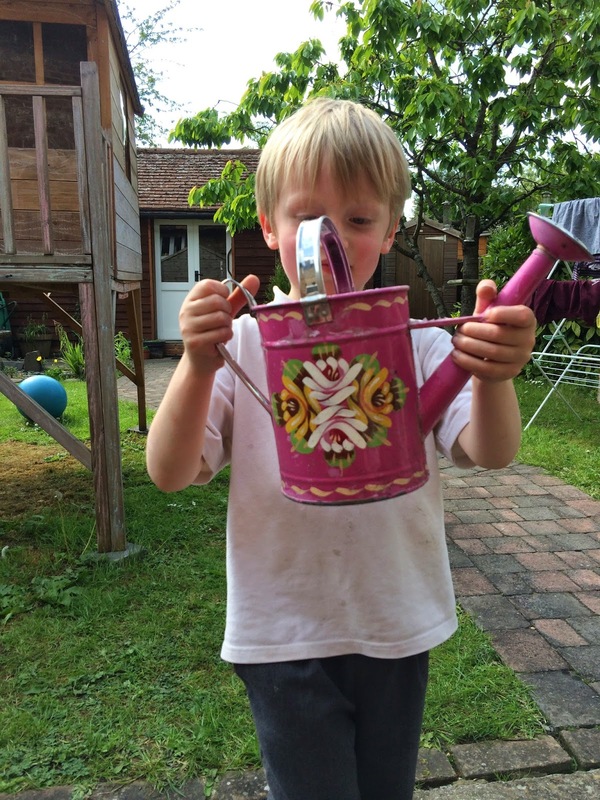 But no - the two children spent the whole hour helpfully watering everything in the garden- whether it needed it or not! This included the grass which is now probably scorched and brown, our feet, the frogs in the pond and each other. All the time the two of them chatted and chatted in between asking for yet another refill of their watering cans. But in this age of sophisticated electronic entertainment and HD/3D/OTT stimulation, isn't it nice that the age-old pastime of tipping water and watching it trickle into the earth hasn't lost its charm? Good old fashioned fun in the great outdoors, it's free and you can't beat it! Thanks for linking up and sharing with Country Kids.